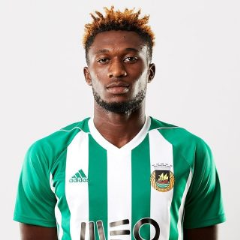 Former Plateau United multi-purpose defender, Kelechi John is getting closer to winning his first silverware in Portuguese football after he and his team-mates at Rio Ave pounded Portimonense 4-1 earlier today to finish top of the first round of the Liga Revelacao on 52 points. The second round of the Liga Revelacao will start in about a week's time. The 20-year-old Kelechi has been a mainstay in the Rio Ave squad in the Liga Revelacao starting 22 games in 23 appearances this campaign. The player who had told allnigeriasoccer.com days ago that his priority was to develop his game in Portugal and not to make money has been a super regular with the Rio Ave Under-23 team and it is expected he will rejoin the main squad pretty soon. In the provisional standings, Estoria are in second spot in the first round of the Liga Revelacao with SL Benfica placing third.